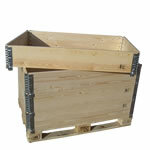 Turn a pallet into a box with these wooden pallet collars. 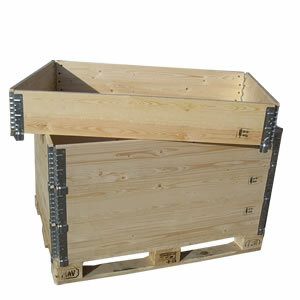 Pallets are very effective at storing flat items, but when faced with irregular shapes or a collection of loose objects, sometimes you need to add sides to the pallet to prevent spillage. These four sides of wood are hinged at all corners so that they can be stored flat and opened out onto a pallet when required. To create a deeper storage area, these collars can be stacked on top of each other.